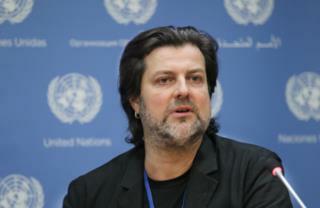 (Newser) – A former United Nations musical director allegedly embezzled $750,000 from a charity concert for homeless and displaced children, spending some of the funds on a home for his ex-wife. Robin DiMaggio—a professional drummer who's worked with artists like David Bowie, Diana Ross, Tupac, and Johnny Cash—was arrested Friday on a felony wire fraud charge after a promise to help a nonprofit put on a star-studded charity concert in the Bulgarian capital of Sofia, inspired by the 1985 Live Aid benefit concert, per KTLA and NBC News. Per CBS Los Angeles, DiMaggio, 47, was wired $750,000 in August 2016 to pay artists he agreed to recruit. But prosecutors say "he took the money, deposited it into his own account, never put it in an escrow account," then spent it on cars, living expenses, and a $250,000 home in Calabasas, Calif.
A noble idea, to do a charity concert for homeless and displaced children, but shame on him for not following through with it ! ! ! Unfortunately, this is not the first time money has been taken in for a noble cause and then someone or someone’s, turn around and blow it and the noble cause gets squat ! ! ! Too many charities, solicit funds from people and very little gets to the actual cause, due to “Administrative Costs”, which is bull ?? for we wasted it on ourselves and our debts, before it got to you. The UN had a Musical Director? "and a $250,000 home in Calabasas, Calif." You can buy a home in California for $250,000?